Chefs who know how to take a little of this from one culture and blend it into the food of another culture are incredibly talented. These restaurants have chefs that have mastered the art of culinary fusion, succeeding in titillating diner’s palates with an explosion of flavors from around the world. 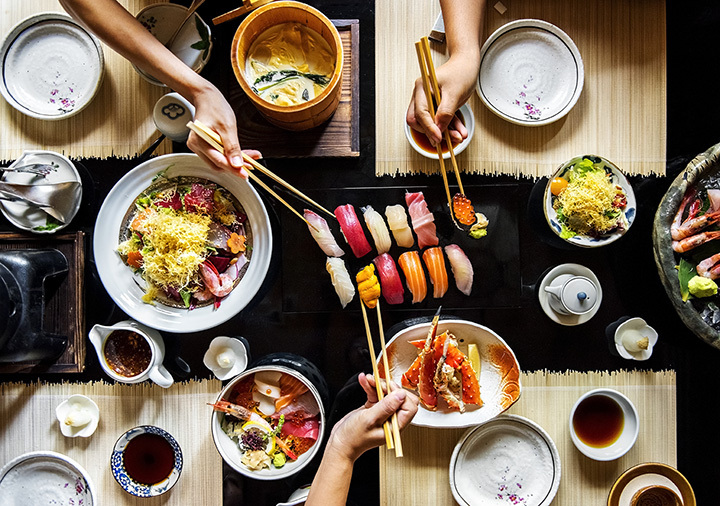 From China to the Philippines to Japan to the Pacific Islands to California and beyond, you’ll find an enormous selection of Pan-Asian food and more at this restaurant. It’s a small-town highlight that’s locally owned and operated and committed to bringing Hobbs to life through good eclectic food. A create your own stir fry menu option lets you pick your favorite ingredients. There are 20 different choices of hand-rolled sushi. Be sure to save room for the banana spring roll dessert. East meets West in a melding of tastes and flavors that highlight so many different dishes like dim sum, sushi, tapas, miso, tempura, paella and teriyaki ribs, you’ll be hard-pressed to pick one. Pacific Island ceviche, Hawaiian Poke tuna, rice paper salmon and Bento boxes filled with mouthwatering Bulgogi beef or pecan chicken are not to be missed delights. Vegetarian and gluten free diners will find a wide-range of choices. Don’t leave without a taste of the tempura ice cream. This restaurant is a little bit of China, Japan and Thai rolled into one giant bento box with chopsticks. The Pan-Asian flair to the food highlights Thai curries, udon noodles, teriyaki bowls, pho, stir fry and sushi. The vibrant and complex flavors of each dish is a tribute to its country of origin and create a rollercoaster ride for your taste buds. Outdoor seating features lounge chairs and a calming water feature. Pacific Rim cooking, that blend of Pacific Island foods complemented by Asian cooking styles and accented with California freshness, is the high-light of this menu. You’ll find stylish dishes from Japan, Hawaii, China, Thailand, Vietnam, Singapore and Malaysia. Don’t miss the Pad Thai, Shaking Beef or Malay Coconut soup. Everything is made from scratch minus any preservatives and MSG. Gluten-free and vegetarian options available. You will discover the character of two distinctive cuisines, Latin and French, plus a soupçon of New Mexico, at this small, colorful adobe. Paella, Parisian crepes, a Spanish tortilla and Croque Monsieur and Madame sandwiches are just the tip of the culinary fusion pyramid that makes this restaurant a destination. Add in that the breads, croissants and pastries are handmade and you’ll be back again and again. Some vegetarian options. In Swahili, jambo means hello. That’s what you’ll exclaim here … hello to a mix of Indian, Arabic, European and, of course, Swahili fare that transports you to each region. The owner hales from Lamu Island, just off the coast of Kenya in East Africa. The cuisine is vibrant and sparkling, spicy and seasoned with all the flavors of the exotic countries that populate the menu from Moroccan lamb to Kenyan kababs to Jamaican Jerk chicken and Island spiced mahi mahi. Great for vegetarians, too. The mingling of Chinese, Thai and Vietnamese are essential ingredients of the cuisine found at this modern, yet traditional restaurant. Chinese lettuce wraps and Imperial egg rolls pair perfectly with hot and sour soup and red or yellow curry, as well as Pad Thai or a Vietnamese salad. The cooking innovation in each dish showcases a wide-range of flavors and tastes found in distinctive Asian dishes. Many dishes are perfect for vegetarians. A restaurant that bills itself as “the melting pot of taste,” is, certainly, one not to be missed. The use of high quality ingredients prepared with a mix of European and American flavors sets the tone for a menu filled with mouthwatering rustic dishes prepared exquisitely. From classic French dishes to American burgers to New England crab cakes, the uncomplicated and unpretentious food makes this bistro the perfect neighborhood watering hole. The poké bowl phenomenon has become a firmly fixed culinary triumph in cities across the country. This Hawaiian mainstay takes center stage at this Asian-Latin restaurant not far from the University of New Mexico campus. Create the meal you want with their build-your-own poké bowl process that lets you begin with a base of rice, salad or chips and then add those flavors that make your taste buds sing … wasabi, chipotle, Sriracha, chimichurri and teriyaki.